Freeze drying allows us to preserve food in a very delicate manner, by preserving the flavour, colour, structure, vitamins and minerals. 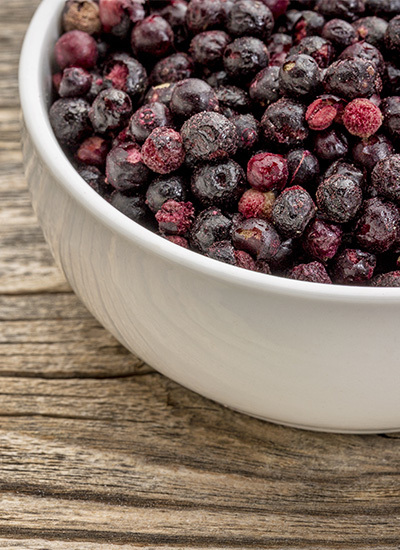 At Tastelab we offer the food industry and home users the opportunity to freeze dry products ranging from herbs, vegetables, fruit, berries and other speciality products. We use innovative technology to deliver top quality products. Freeze dried foods can be used in cereal mixes, baked goods, smoothies and other drinks, ice cream as well as desserts. During the process of freeze drying products are first frozen, after which moisture is gradually removed from the product by means of a vacuum. Moisture is removed in the form of steam through sublimation. Cell structures remain open, which allows the product to be rehydrated to its original form with ease. Contact us to talk about capabilities. Tastelab is a young, vibrant and modern company specialising in product design to create innovative food products for every consumer. 2016 Tastelab. All rights reserved.